Brandon Nelson kayaked 151.87 miles in a 24-hour period, establishing a new world record. The Guinness Book of World Records certified the record on September 5, 2013. Nelson, a 41-year-old father of two began his record paddle on August 21, 2013. He began at 8:00am on a 1.73 mile course on Lake Padden, Washington. Nelson had to beat a 2006 record of 150.34 miles, set on Lake Merced, California. Nelson would have to average 6.27 mph to break the record. Nelson completed the first 12 hours with a 7 mph average, but he began to run into problems on the second 12 hours. He had hallucinations during the night and actually fell off his boat on 3 occasions. His diet of Hammer products, caffeine tablets, Red Bull and “junk food” nearly stopped him. On August 22, Wednesday morning, a fatigued Nelson staggered off his kayak and was helped to shore. He was taken to the hospital and given an IV. Nelson had completed what he set out to do: Break the World Record 24-hour record on flat water. His inspiration: A promise he made to his late mother. 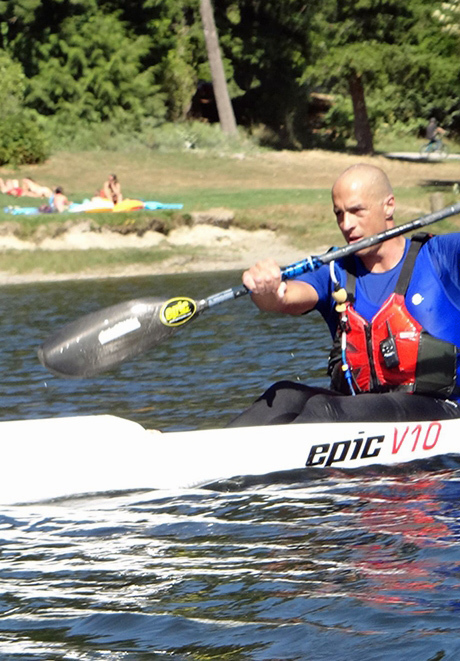 Nelson paddled an Epic V10 “Surfski” on his record paddle. The V10 is 21 feet 2 inches long and weighs 37 pounds.